David Berger says these are the building blocks you need to achieve and demonstrate measurable gains. How many of you reading this work in maintenance or asset management? Typically, those people who read articles or attend lectures and workshops on how to improve the productivity of the asset management function are already converts to the idea that huge savings can be won by improving maintenance productivity. A company’s economic buyers are not always in this group. When CMMS vendors try to sell the productivity improvement potential of their systems to the plant manager, VP of operations, or the president, they are more often than not politely referred to the maintenance manager. To get down to the business of significantly improving productivity will require concerted effort on behalf of the maintenance community to change the base attitude of people toward asset management and maintenance. In terms of priority for this effort, it is top management that should receive the greatest attention. With top management on board, it will be a lot easier to focus attention on building an infrastructure for productivity improvement. Described below are some of the basic building blocks of the infrastructure needed for improving productivity. Maintenance management must understand these concepts thoroughly and sell top management on their application. Your best and possibly only shot at persuading top management requires selling solutions first to operations, engineering, marketing, and any other stakeholder departments. If operations and engineering management can be deeply involved in developing an asset management strategy that benefits maintenance and operations, you will have gained an important ally. The asset management strategy must provide a long-term game plan complete with measurable goals and objectives, framed by overall business strategies. Once you have drafted a strategy, planned a program for meeting established targets, and proposed a measurement system (a CMMS) for helping manage the program, then you have a solid case to present to top management. Top of mind for most senior executives is how to squeeze more profit out of the company through reduced costs and increased sales. Asset management cost savings can be substantial, especially considering the savings sourced from operations. Thus, once a strategy is formulated, a budget showing costs and savings of implementing the plan must be prepared, using the CMMS as the key planning tool. Use the CMMS to determine where to spend more money (for example, on aging equipment that is cheaper to replace than repair) and where to cut the budget (e.g., dropping the level of spare parts inventory where turnover is low) and to help illustrate the consequences of cutting budgets too deeply (e.g., show the correlation between PM spending and equipment availability for a given production line). Many government and private companies are investigating contract maintenance as a way to reduce maintenance costs. However, numerous considerations must be explored before you go this route. A thorough cost/benefit analysis is necessary before you replace any part of your in-house maintenance team, regardless of how frustrated you may be with labor relations. 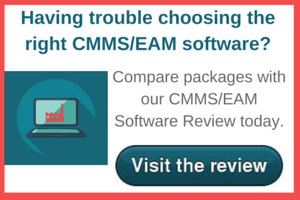 Use the CMMS to build a business case to show the net benefit/cost of contract maintenance. Engineering, operations, and even senior management teams love new technology if it shows quality or productivity improvement potential. Leverage new technology such as the industrial internet of things (IIoT), artificial intelligence (AI), and advanced data collection and analysis systems. Build new technology into your asset management strategy, budget, and business case wherever it makes sense. Senior managers in most asset-intensive industries care deeply about ways to decrease risk, especially as our dependency on technology increases. This includes elements such as safety, regulatory compliance, and environmental impact. Structure your asset management strategy and proposed process improvements to show how you intend to better monitor and control risks through improved asset management. This is sure to boost top-management support for your business case. Many companies have enjoyed considerable benefit from emphasizing the importance of people rather than operations equipment used or the products/services produced. In the asset management field, we are reliant on both maintainers and operations personnel to ensure equipment is working at peak performance in a safe environment. However, some companies have combined these two functions such that operators are responsible for monitoring the product, process, and environment as well as the assets. Probably the area of highest impact in the human resources arena is establishing standards of excellence for each line item on tradespersons’ job descriptions. Standards are set for safety, quality (how clean is clean? ), performance (targets in light of the overall asset management strategy), and skill requirements (those skills needed to properly do the job). Standards can be built into the CMMS and actuals tracked against them. This is a time-consuming exercise, but it gives workers a sense of what is expected and management with the necessary framework for cranking up productivity. Process engineering is simply questioning why and how things get done. For example, by examining reports from a CMMS, you may determine that the work-order process is not working efficiently. There may be multiple work requests for the same work, poor response times, or a long list of incomplete work orders. By studying the work-order process, you may discover unnecessary or inefficient steps. This, in turn, can lead to development of a more-streamlined process with fewer steps, more responsiveness, and greater flexibility. Re-engineering is best accomplished in a workshop environment with representation from all relevant stakeholders. Benchmarking is a means of comparing your maintenance department’s performance with that of “best in class” performance, and CMMS tools often are underutilized for this purpose. But for companies that have been able to effectively use the CMMS as a planning and tracking tool, the rewards are substantial in building a more comprehensive infrastructure for improving productivity.